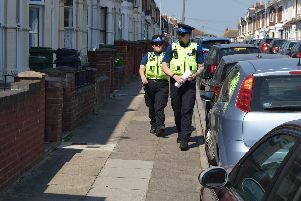 FIVE teenagers have been released from custody after being arrested in an investigation into a stabbing near Hilsea train station. The victim, a 24-year-old man, was walking away from the station with his girlfriend between 9.30pm and 10.30pm on August 26, when they were followed by a group of ‘four or five’ youngsters, police said. He was then tripped over, kicked, punched and hit in the face with a belt, before being chased by one member of the group as he ran toward the junction with Sywell Crescent in Anchorage Park – where he was stabbed in the back. Two 13-year-old boys were arrested in relation to the crime – including one on suspicion of causing grievous bodily harm without intent. However, police have confirmed the two boys have been released but remain under investigation. Additionally, another 13-year-old boy, a 15-year-old boy and a 17-year-old boy have also been arrested and released under investigation.